November 3, 1970: [Jeff Terpko was] traded by the Washington Senators with Greg Goossen and Gene Martin to the Philadelphia Phillies for a player to be named later and Curt Flood. The Philadelphia Phillies sent Jeff Terpko (April 10, 1971) to the Washington Senators to complete the trade. So finally, through the seemingly inconsequential and absurd figure of a player to be named later turning out to be a player already named, we reach the realm of history, or at least what could be considered a footnote to history. I am referring to that most notable player involved in the Terpko for Terpko trade: Curt Flood. Before being involved in the trade that featured two teams treating Jeff Terpko like a bad luck charm, Curt Flood was involved in arguably the most important transaction in baseball history, a trade between the Cardinals and the Phillies that Curt Flood refused to accept. His refusal to report to the Phillies set in motion the end of the reserve clause in major league baseball, a clause that had allowed teams to treat players like chattel (or like Jeff Terpko) for decades. Flood’s good major league career was basically brought to an end by his taking a stand, but the trade listed above did allow him to have a few final largely ineffective at-bats with the Senators in 1971, a season that proved to be a footnote to what eventually came to be seen, because of his brave and self-sacrificing stand, as a historic career. A footnote to that footnote to that footnote shows that Terpko had a knack for ghosting peripherally at the edges of careers of guys taking stands. Later he was traded for Rodney Scott, who in turn, some years later, was released by the Montreal Expos, which caused Expos teammate Bill Lee to stage a one-man strike against the team. If I remember correctly, Lee first bolted from the stadium before a game to drink beer and play pool for a few innings, though I think he did return when he thought he might be needed in relief. I think the next day he went into the general manager’s office and sat there chanting in a lotus position until the general manager arrived and told him his services would no longer be needed. Terpko’s exit from the majors happened a few years earlier and was more conventional. He entered a June 2, 1977, game in the sixth inning against the New York Mets. His team, the Expos, was down 6-3. He walked Len Randle, allowed Len Randle to steal second, got Felix Milan to fly out, then walked the bases full and was yanked from the game and never called on again. 1. The minor league underbelly of the flashy majors reminds me of traveling circuses, full of roadies and ready to pick up and move in the middle of the night. It’s a necessary support structure for the mlb play we all love but thinking about it is humbling and a little sad. 2. Those Topps photogs sure loved hangin’ around at Oakland Alameda in those days. Must’ve been all that extra foul territory that had to work with. Doesn’t Jeff kinda look like George W Bush? This reminds me of one of those cards you get when you’re a kid where they take a pic of you and make it look like you’re a real major leaguer–and this is George W’s card. But he was, like, 22 years old, and insisted they make one for him, on his favorite team, the Texas Rangers. 3. I actually remember Jeff Terpko. I had an APBA baseball game, which I only played for 1 season before moving on to Strat-O-Matic. 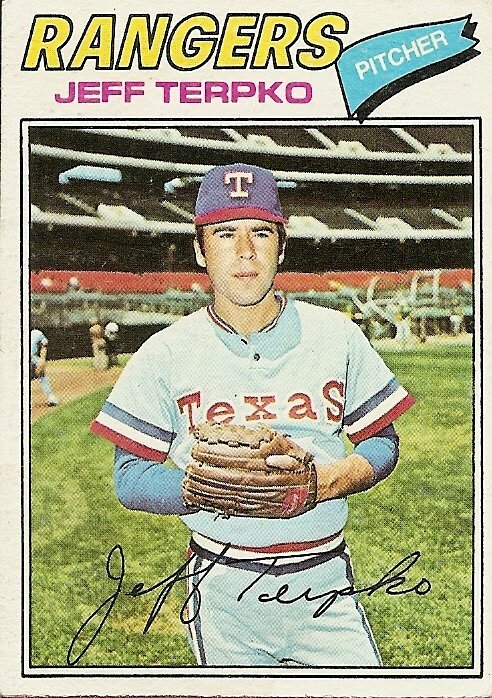 That season was 1976, when Jeff Terpko had his best year with Texas. 4. 1 : Yeah, it’s also really the only level us “regular guys” can relate to, in an economic sense. You get to the majors and you’re a corporation unot yourself, more or less. 3 : Being able to remember Jeff Terpko really separates the men from the boys. I didn’t start in with Strat until after he had gone into the Beyond. I never tried APBA baseball, but I played APBA football for a while. It was fun but extremely unweildy, with several giant cardboard charts to sort through and consult for every two-yard run.